After reading early reviews of the Qshave Parthenon, which was built in cooperation with Weishi, I saw a link to this and became curious. By all appearances, it looks much like the early design presented on Qshave's Kickstarter page, with drainage holes below the base plate. I'm fond of the Weishi 9306 model, of which I have the VDH relabels in short and long handle. But I'm looking for a good adjustable modern razor that won't break my bank or present alignment issues as with the Merkur Progress. Has anyone used this yet? If so, what were your thoughts on its performance and construction? EDIT: The image is of the Weishi adjustable razor, taken from Amazon where it is available for purchase. No links are included, but you can probably find it by searching the site. 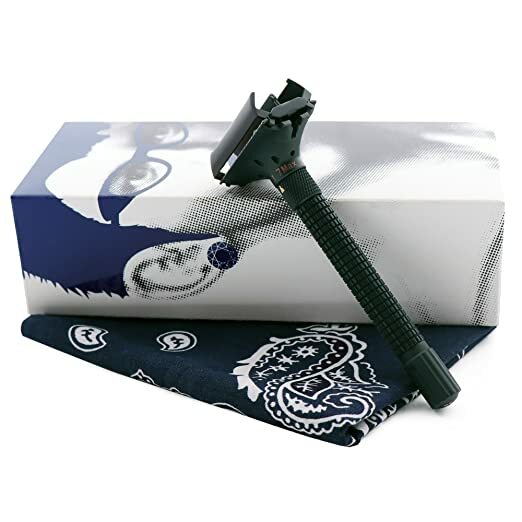 I have the new one...paid $49.00 with 50 Feather blades..took only one week from China..built like a tank..shaves like a dream...you can get them now for $49.00 but now they only include 5 blades...mine is the silver /black....one of the best razors I have ever bought and one of the most reasonably priced...really quite amazing value and it is really well made and designed. I just bought one on Amazon. Ive got a Qshave on order too. Oh well, so much for my no-buying pledge. On italian forum ilRasoio, there's a pic about the setting. The MAX is over 7 ... and looks like there're 8 stepless adjustable settings. But on the web I read about 7 settings.